The Most Social Booth Ever! 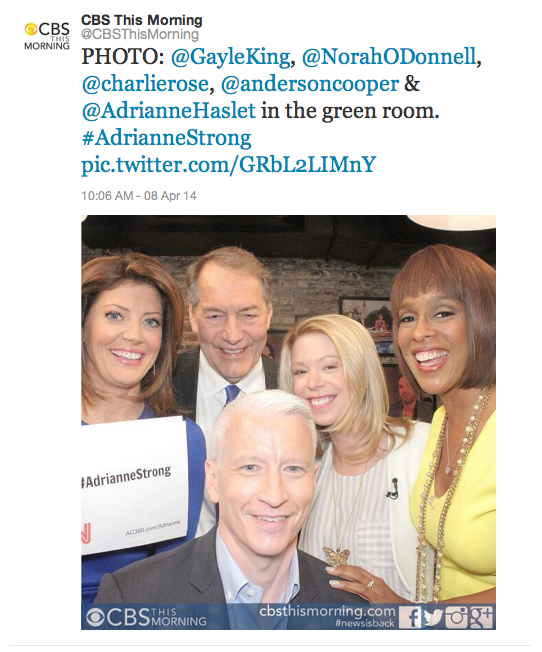 CBS News This Morning tweeted an image from the MVS PhotoBooth in their green room featuring hosts Charlie Rose, Gayle King, Nora O’Donnell and guest Adrianne Haslet—along with our fav, Anderson Cooper! The shot brings together a few TV shows that have used our PhotoBooths to capture moments on set and share them with the world on social media. The Digital PhotoBooth we installed last year on the set of Anderson Live fed directly into their commercial break stills, and the show included a “getting into the Booth” segment. Currently, we have a custom Booth on the set of CBS This Morning that takes stills and animated GIFS in their green room. The content lives best (and longest) online, and creates a conversation through social media for each of these shows. Just think what it could do for your brand! Here’s how it works: we can upload PhotoBooth images directly to our web galleries, where guests can Facebook, Tweet, Pin, and email to their hearts’ content. They can even save the image to their device and Instagram it! We also have a custom iPad app that shares customized posts to Facebook, Twitter and email and also allows you to capture data, which is useful for connecting to guests that interacted with your brand at the event. Hit us up by email or just hit the Book the Booth button above!